Reading and share top 6 famous quotes and sayings about Doctoring by famous authors and people. Browse top 6 famous quotes and sayings about Doctoring by most favorite authors. 1. 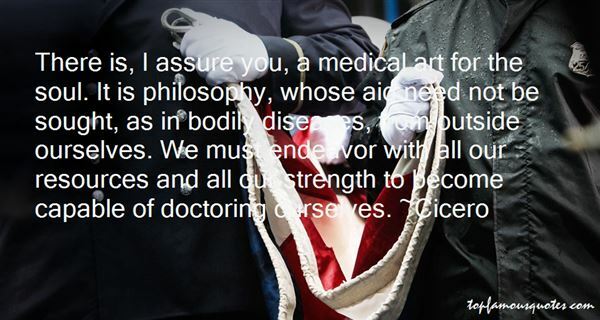 "There is, I assure you, a medical art for the soul. It is philosophy, whose aid need not be sought, as in bodily diseases, from outside ourselves. We must endeavor with all our resources and all our strength to become capable of doctoring ourselves." 2. "I did three or four weeks of work on 'Godzilla;' it wasn't a page-one rewrite or anything like that. The term is 'script doctoring,' is what I did on it." 3. "Doctoring her seemed to her as absurd as putting together the pieces of a broken vase. Her heart was broken. 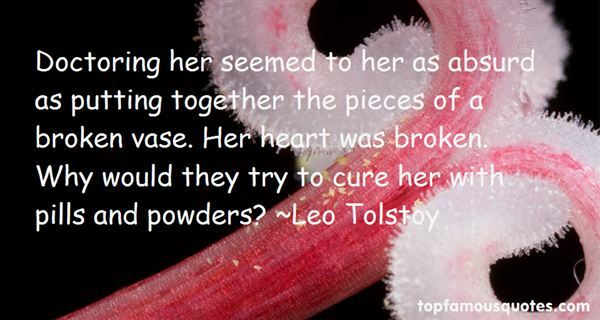 Why would they try to cure her with pills and powders?" 4. 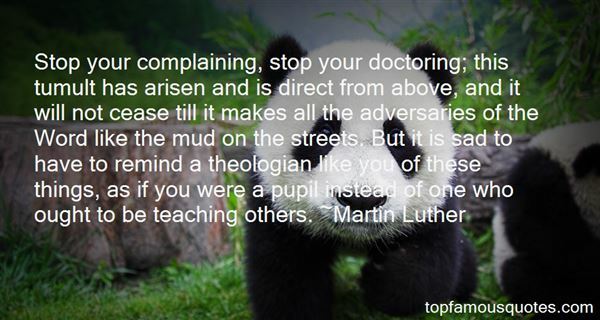 "Stop your complaining, stop your doctoring; this tumult has arisen and is direct from above, and it will not cease till it makes all the adversaries of the Word like the mud on the streets. But it is sad to have to remind a theologian like you of these things, as if you were a pupil instead of one who ought to be teaching others." 5. "Do you know what a poem is, Esther? 'No, what?' I would say.A piece of dust. 'Then, just as he was smiling and starting to look proud, I would say, 'So are the cadavers you cut up. So are the people you think you're curing. They're dust as dust as dust. I reckon a good poem lasts a whole lot longer than a hundred of those people put together. 'And of course Buddy wouldn't have any answer to that, because what I said was true. People were made of nothing so much as dust, and I couldn't see that doctoring all that dust was a bit better than writing poems people would remember and repeat to themselves when they were unhappy or sick or couldn't sleep." 6. "I respect him. He has brains and character; and that, I may tell you, is a very unusual combination. I don't suppose you know what he is doing here, because I don't think he's very expansive with you. If any man singlehanded can put a stop to this frightful epidemic he's going to do it. He's doctoring the sick, cleaning the city up, trying to get the drinking water pure. He doesn't mind where he goes nor what he does. He's risking his life twenty times a day. He's got Colonel Yü in his pocket and he's induced him to put the troops at his disposal. He's even put a little plunk into the magistrate and the old man is really trying to do something. And the nuns at the convent swear by him. They think he's a hero."